This is the same high quality WHITE Vapor Apparel 5.9 oz. 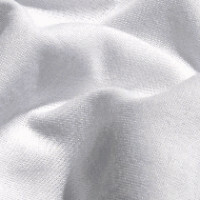 weight, 100% spun polyester classic t-shirt fabric used in the Basic T Shirts and other garments. Sold by the linear yard - enter the number of yards you want in the quantity field. Width is approximately 61 inches. Cut up and use for samples, practice, or make your own custom fabric swatches for quilts or other projects.